The Forensic Science program is excited to introduce Dr. Abdelhay. Karim Abdelhay was born and raised in Alexandria, Egypt. After developing an interest in Pharmaceutical Sciences and Chemistry at a young age, he joined the School of Pharmacy at Alexandria University. In 2001, he received his Bachelor degree in Pharmaceutical Sciences and became a registered certified pharmacist. He also served as a teaching and research assistant and received his Master of Pharmaceutical Analytical Chemistry degree in January 2005. Three years later, he joined Harrison School of Pharmacy at Auburn University, Alabama as a doctoral student and earned his PhD in Pharmaceutical Sciences with a Medicinal and Forensic Chemistry concentration in Spring 2012. Following that, Karim was appointed as a postdoctoral fellow and research scholar for the Department of Drug Discovery and Development at Auburn University. During that period, Karim extended his expertise in Forensic Chemistry working on various research projects focusing on developing analytical methodology for the differentiation of regioisomeric and isobaric compounds that are structurally related to designer drugs of the amphetamine, piperazine, cannabinoid and bath salts classes. 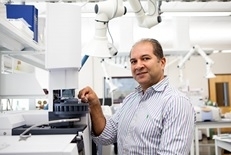 Karim’s research is considered as a part of an overall effort to provide for greater analytical specificity in the identification of individual drug species via evaluation of the most likely imposter molecules. Additionally, his research is designed to test and challenge the specificity of methods used in forensic drug sample evaluation and identification. In 2015, Karim moved back to Alexandria working as an Assistant Professor of Pharmaceutical Sciences and he got promoted to Associate Professor in January 2018. Karim’s research efforts are reflected by the appearance of 32+ journal full-text publications and 21 conference publications. Karim is currently appointed as a full-time Assistant Professor of Chemistry and Forensic Sciences at the Department of Chemistry at Eastern Kentucky University. During his free time and weekends, Karim enjoys running, playing soccer and kayaking.